Harry Potter’s third year at Hogwarts is full of new dangers. A convicted murderer, Sirius Black, has broken out of Azkaban prison, and it seems he’s after Harry. Now Hogwarts is being patrolled by the dementors, the Azkaban guards who are hunting Sirius. But Harry can’t imagine that Sirius or, for that matter, the evil Lord Voldemort could be more frightening than the dementors themselves, who have the terrible power to fill anyone they come across with aching loneliness and despair. Yet despite the relative safety of life at Hogwarts and the best efforts of the dementors, the threat of Sirius Black grows ever closer. This is the book where we start to see the books getting longer as more detail is included. This is of course a good thing because with book three so much of the basic wizarding rules have been established and we’re secure in what we know about the world. With this story Rowling really takes advantage of this and takes on such a deep and detailed journey, not only through the expanding wizarding world, but into the past, learning more about the war and more information about Harry’s family. As always with a Potter book there are surprises and unexpected twists, even now rereading it for the umpteenth time I still get nervous and worried as I read, despite knowing full well what is about to happen. Rowling immerses you so deeply into her world that you feel like you are falling into them as you read, surrounding yourself with the events on the page. I always love reading about the daily schooling life, something the movies don’t focus on very much which is a shame but understandable. There’s also so much history and backstory revealed, as well as the typical Rowling hints that something is going on but we aren’t sure of what yet, no doubt to be revealed in a later chapter or even book. There is a great sense of action and thrill through this book, the killer on the loose angle is paced wonderfully, and as I say, the twists Rowling throws in there are enough to keep you reading intently no matter ow many times you’ve read the same words before. It is the third longest book at 107,253 words. 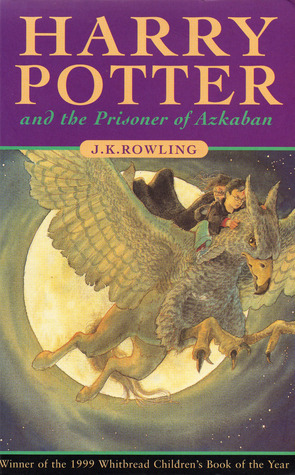 Rowling started to write Prisoner of Azkaban the day after she finished Chamber of Secrets. I hadn’t heard that bit about Rowling writing this book straight after she finished no. 2. Pretty impressive. Neither had I! I guess it makes sense when you’ve got almost a whole story in your mind just to keep writing.